Contact Us for No Risk Assessment !!! Hello. I'm Yetunde Adegoju, Centre Director/Owner of Mathnasium of Airdrie, your neighbourhood math-only learning centre. We help kids in grades 2-12 understand math by teaching the way that makes sense to them. At Mathnasium of Airdrie, we help children to understand, catchup and master math in a way it makes sense, develop problem-solving and critical thinking skill with fun. We transform lives through Math. So far I am seeing a positive change in my son. He looks forward to attending sessions. I appreciated the genuine concern in my child’s math education. We will be back next term for sure. You helped our son, Martin, pass his Math 30-1 diploma exam with 86%. Thank you for your dedication to help students achieve. We will always recommend you wherever we go. My 12 years and 7 years old have become more confident in their math skills, they always look forward to going to mathematics lessons every time. The teachers are very knowledgeable and excellent customer service. Will recommend Mathnasium any day any time. Good job guys. Its only been 6 weeks since my son started going to Mathnesium but he certainly start liking math a lot more then before. The staff and owners are very friendly. I would recommend to everyone. Parents usually provide tutor or extra help to kids if they are weak in a certain subject but I had a need to do this because my son can take so much more and school cannot feed his brain according to his capacity. Mathnasium is the best choice I made for him as it allows him to grow by following board of education curriculum which is a must for me. 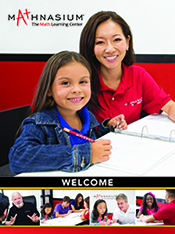 I also registered my daughter to Mathnasium for her high school Math preparation and amazing instructors making sure that students are if not ahead than for sure according to their grade level. Sometimes it seems a lot of money but if we really calculate private tuition fee and the days and hours flexibility Mathnasium providing, you will find Mathnasium way better. You guys are doing great job. Every child need good grade in math and your coaching effort help them to achieve their best goals. You guys are absolutely great. You are doing a good job with the students under your care. My son’s confidence & performance & self discipline have all improved. I’m so impressed by the Mathnasium team! Thanks Peter, Yetunde & team! My daughter enjoyed it! The instructors were/are good and made it so that my daughter understood the math. We are happy she came and will not hesitate to come back if we need it! It was 100% obviously these people truly care about the kids they worked with. I would absolutely recommend anyone with kids in need of math help to try the Airdrie location. My daughter had a 34% in grade 9 math and now going into term 2 she is up to a 67%!!! Amazing work!! Director and staff are reliable and they show interest in seeing my kids improve. They provide ongoing feedback on their progress. I like that they collaborate with the schools. My son loves going to Mathnasium and that means the world to our family. He has struggled with Math and understanding mathematical concepts and Mathnasium has helped him enjoy the subject. He looks forward to going to his class now and is very proud of the work he is doing. We are very thankful for your services and will share this over and over with anyone in our social circle and family. Thank you to all the tutor/teachers and the facility owners for welcoming us and allowing my son to thrive in a subject he struggled in for so long! As per my daughter and son, they explained maths better, I now understand some of the topics I was making mistakes on. Teachers very knowledgeable. As per me, excellent customers service and have noticed the difference in my kids liking maths. Will definitely be using them. Since my daughter has started to attend Mathnasium, I've seen her marks jump from 50-60% up to 80%! She loves going and enjoys the atmosphere and instructors. I'm very impressed with Mathnasium in Airdrie. Our son has really benefitted with the tutorials. The facilitators are warm and friendly. They truly care about their students. My husband and I are truly grateful for Mathnasium. Our son is so happy. Since starting Mathnasium, my daughter has a new found confidence in mathematics. She comes home, sets up her own Mathnasium at our kitchen table, and makes her little brother partake! We are very happy with you and what you are doing with Martin. We advertise Mathnasium everywhere we go. We put up your poster at Beth's school as well. The class environment is good for the students , stuff go up and beyond to help the students. My child gets one on one attention and works from her level based on the assessment scores given prior. I love that we are given reviews on my child’s progress and that they work collaboratively with the schools.